This article is about the film. For the soundtrack, see The Prince of Egypt (soundtrack). The Prince of Egypt is a 1998 American animated musical drama film produced by DreamWorks Animation. It is the first DreamWorks feature to be traditionally animated. The film is an adaptation of the Book of Exodus and follows the life of Moses from being a prince of Egypt to his ultimate destiny to lead the children of Israel out of Egypt. Directed by Brenda Chapman, Steve Hickner, and Simon Wells, the film features songs written by Stephen Schwartz and a score composed by Hans Zimmer. The voice cast consists of Val Kilmer in a dual role, Ralph Fiennes, Michelle Pfeiffer, Sandra Bullock, Jeff Goldblum, Danny Glover, Patrick Stewart, Helen Mirren, Steve Martin, and Martin Short. Jeffrey Katzenberg had frequently suggested an animated adaptation of the 1956 film The Ten Commandments while working for The Walt Disney Company, and he decided to put the idea into production after founding DreamWorks in 1995. To make this inaugural project, DreamWorks employed artists who had worked for Walt Disney Feature Animation and the recently disbanded Amblimation, totaling a crew of 350 people from 34 different nations. The film has a blend of traditional animation and computer-generated imagery, created using software from Toon Boom Animation and Silicon Graphics. The film was theatrically released on December 18, 1998, and on home video on September 14, 1999. Reviews were generally positive, with critics praising the animation, music, and voice work. The film went on to gross over $218 million worldwide in theaters, which made it the most successful non-Disney animated feature at the time. The film's success led to the direct-to-video prequel Joseph: King of Dreams (2000) and the development of a stage adaptation. The song "When You Believe" became a commercially successful single in a pop version performed by Whitney Houston and Mariah Carey, and went on to win Best Original Song at the 1999 Academy Awards. In Ancient Egypt, Pharaoh Seti, fearing that an alarming increase of Hebrew slaves could lead to rebellion, orders his guards to kill all of the newborn Hebrew boys. Fearing for her own newborn son's safety, Yocheved, along with her two young children, Miriam and Aaron, rushes to the Nile River, where she places him in a basket on the water, not before bidding him farewell with a final but powerful lullaby. Miriam follows the basket as it sails to the Pharaoh's palace and witnesses her baby brother safely adopted by Seti's wife Queen Tuya, who names him Moses. Years later, Moses and his adoptive brother Rameses, heir to the throne of Egypt, are scolded by their father for accidentally destroying a temple during a chariot race. At Moses's suggestion, Seti, seeking to give Rameses the opportunity to prove that he is a responsible young man, names him Prince Regent and gives him authority over Egypt's temples. As a tribute, the high priests Hotep and Huy offer him a beautiful young Midianite woman, Tzipporah, whom Rameses gives to Moses, appointing him Royal Chief Architect. Later that night, Moses follows Tzipporah as she escapes from the palace, and runs into the now-adult Miriam and Aaron, but he does not recognize them. Miriam then sings their mother's lullaby, which Moses remembers; however, he returns to the palace, eager to go back to familiar surroundings. The truth about his past is later confirmed by a nightmare, and finally by Seti himself, who disturbs Moses by claiming the Hebrews were "only slaves". The next day, Moses accidentally pushes an Egyptian guard to his death while trying to stop him from whipping an elderly Hebrew slave. Horrified and ashamed, Moses flees into the desert in exile, despite Rameses's pleas that he stay. While in the desert, Moses defends three young girls from brigands, only to find out their older sister is Tzipporah herself. Moses is welcomed by Tzipporah's father and the high priest of Midian, Jethro. After assimilating into this new culture, Moses becomes a shepherd and marries Tzipporah. One day, while chasing a stray lamb, Moses discovers a burning bush, through which God tells him to go back to Egypt and guide the Hebrews to freedom. God bestows Moses's shepherding staff with his power and promises that he will tell Moses what to say. Moses and Tzipporah return to Egypt, where Moses is happily greeted by Rameses, who is now Pharaoh with a wife and son. Moses requests the Hebrews' release and changes his staff into an Egyptian cobra to demonstrate his alliance with God. Hotep and Huy boastfully recreate this transformation, only to have their snakes eaten by Moses's snake. Rather than be persuaded, Rameses hardens and doubles the Hebrews' workload. Moses inflicts nine of the Ten Plagues of Egypt, but still Rameses refuses to relent and, against Moses's warning (foreshadowing the final plague), vows never to release the Hebrew slaves. Disheartened, Moses prepares the Hebrews for the tenth and final plague, instructing them to sacrifice a lamb and mark the doorposts with the lamb's blood. That night, the final plague kills all the firstborn children of Egypt, including Rameses's son, while sparing those of the Hebrews. A grief-stricken Rameses finally gives Moses permission to free the Hebrews. After leaving the palace, Moses collapses weeping with grief, heartbroken at the pain he has caused his brother and Egypt. The following morning, the Hebrews leave Egypt, led by Moses, Miriam, Aaron, and Tzipporah. At the Red Sea, they discover that a vengeful Rameses is pursuing them with his army, intent on killing them. However, a writhing pillar of fire blocks the army's way, while Moses uses his staff to part the sea. The Hebrews cross the open sea bottom; the fire vanishes and the army gives chase, but the water closes over and drowns the Egyptian soldiers, sparing Rameses alone. Moses sadly bids farewell to his brother and leads the Hebrews to Mount Sinai, where he receives the Ten Commandments. Val Kilmer as Moses, a Hebrew who was adopted by Pharaoh Seti I and Queen Tuya. Amick Byram provides Moses' singing voice. Ralph Fiennes as Rameses II, Moses' adoptive brother and eventual successor to Seti. Michelle Pfeiffer as Tzipporah, Jethro's oldest daughter and Moses' wife. Sandra Bullock as Miriam, Aaron's sister and Moses' biological sister. Sally Dworsky provides Miriam's singing voice. Eden Riegel provides the voice of a younger Miriam. Jeff Goldblum as Aaron, Miriam's brother and Moses' biological brother. Danny Glover as Jethro, Tzipporah's father and Midian's high priest. Brian Stokes Mitchell provides Jethro's singing voice. Patrick Stewart as Pharaoh Seti, Rameses' father and Moses' adoptive father, the Pharaoh in the beginning of the film. Helen Mirren as Queen Tuya, Seti's wife, Rameses' mother and Moses' adoptive mother. Linda Dee Shayne provides Tuya's singing voice. Steve Martin as Hotep, one of the high priests who serves as advisor to Seti, and later Rameses. Martin Short as Huy, Hotep's fellow high priest. Director Brenda Chapman briefly voices Miriam when she sings the lullaby to Moses. The vocals had been recorded for a scratch audio track, which was intended to be replaced later by Sally Dworsky. The track turned out so well that it remained in the film. Former Disney chairman Jeffrey Katzenberg had always wanted to do an animated adaptation of The Ten Commandments. While working for The Walt Disney Company, Katzenberg suggested this idea to Michael Eisner, but he refused. The idea for the film was brought back at the formation of DreamWorks SKG in 1994, when Katzenberg's partners, Amblin Entertainment founder Steven Spielberg, and music producer David Geffen, were meeting in Spielberg's living room. Katzenberg recalls that Spielberg looked at him during the meeting and said, "You ought to do The Ten Commandments." The Prince of Egypt was "written" throughout the story process. Beginning with a starting outline, Story Supervisors Kelly Asbury and Lorna Cook led a team of fourteen storyboard artists and writers as they sketched out the entire film — sequence by sequence. Once the storyboards were approved, they were put into the Avid Media Composer digital editing system by editor Nick Fletcher to create a "story reel" or animatic. The story reel allowed the filmmakers to view and edit the entire film in continuity before production began, and also helped the layout and animation departments understand what is happening in each sequence of the film. After casting of the voice talent concluded, dialogue recording sessions began. For the film, the actors record individually in a studio under guidance by one of the three directors. The voice tracks were to become the primary aspect as to which the animators built their performances. Because DreamWorks was concerned about theological accuracy, Jeffrey Katzenberg decided to call in Biblical scholars, Christian, Jewish and Muslim theologians, and Arab American leaders to help his film be more accurate and faithful to the original story. After previewing the developing film, all these leaders noted that the studio executives listened and responded to their ideas, and praised the studio for reaching out for comment from outside sources. Art directors Kathy Altieri and Richard Chavez and Production Designer Darek Gogol led a team of nine visual development artists in setting a visual style for the film that was representative of the time, the scale and the architectural style of Ancient Egypt. Part of the process also included the research and collection of artwork from various artists, as well as taking part in trips such as a two-week journey across Egypt by the filmmakers before the film's production began. Character Designers Carter Goodrich, Carlos Grangel and Nicolas Marlet worked on setting the design and overall look of the characters. Drawing on various inspirations for the widely known characters, the team of character designers worked on designs that had a more realistic feel than the usual animated characters up to that time. Both character design and art direction worked to set a definite distinction between the symmetrical, more angular look of the Egyptians versus the more organic, natural look of the Hebrews and their related environments. The Backgrounds department, headed by supervisors Paul Lasaine and Ron Lukas, oversaw a team of artists who were responsible for painting the sets/backdrops from the layouts. Within the film, approximately 934 hand-painted backgrounds were created. The animation team for The Prince of Egypt, including 350 artists from 34 different nations, was primarily recruited both from Walt Disney Feature Animation, which had fallen under Katzenberg's auspices while at The Walt Disney Company, and from Amblimation, a defunct division of Steven Spielberg's Amblin Entertainment. As at Disney's, character animators were grouped into teams by character: for example, Kristof Serrand, as the supervising animator of Older Moses, set the acting style of the character and assigned scenes to his team. Consideration was given to depicting the ethnicities of the ancient Egyptians, Hebrews, and Nubians properly. There are 1,192 scenes in the film, and 1,180 contain work done by the special effects department, which animates everything in an animated scene which is not a character: blowing wind, dust, rainwater, shadows, etc. A blend of traditional animation and computer-generated imagery was used in the depictions of the ten plagues of Egypt and the parting of the Red Sea. The animated characters were digital paint software using Cambridge Systems' Animo software system (now merged with Toon Boom Technologies), and the compositing of the 2D and 3D elements was done using the "Exposure Tool", a digital solution developed for Alias Research by Silicon Graphics. The task of creating God's voice was given to Lon Bender and the team working with the film's music composer, Hans Zimmer. "The challenge with that voice was to try to evolve it into something that had not been heard before," says Bender. "We did a lot of research into the voices that had been used for past Hollywood movies as well as for radio shows, and we were trying to create something that had never been previously heard not only from a casting standpoint but from a voice manipulation standpoint as well. The solution was to use the voice of actor Val Kilmer to suggest the kind of voice we hear inside our own heads in our everyday lives, as opposed to the larger than life tones with which God has been endowed in prior cinematic incarnations." Composer and lyricist Stephen Schwartz began working on writing songs for the film from the beginning of its production. As the story evolved, he continued to write songs that would serve both to entertain and help move the story along. Composer Hans Zimmer arranged and produced the songs and then eventually wrote the film's score. The film's score was recorded entirely in London, England. Three soundtrack albums were released simultaneously for The Prince of Egypt, each of them aimed towards a different target audience. While the other two accompanying records, the country-themed "Nashville" soundtrack and the gospel-based "Inspirational" soundtrack, functioned as film tributes, the official The Prince of Egypt soundtrack contained the actual songs from the film. This album combines elements from the score composed by Hans Zimmer and film songs by Stephen Schwartz. The songs were either voiced over by professional singers, such as Salisbury Cathedral Choir, or sung by the film's voice actors, such as Michelle Pfeiffer and Ofra Haza. Various tracks by contemporary artists such as K-Ci & JoJo and Boyz II Men were added, including the Mariah Carey and Whitney Houston duet "When You Believe", a Babyface rewrite of the original Schwartz composition, sung by Michelle Pfeiffer and Sally Dworsky in the film. The Prince of Egypt had its premiere at the UCLA's Royce Hall on December 16, 1998, with its wide release occurring two days later. Despite being the inaugural production by DreamWorks Animation, it wound up the second to get a theatrical release, as Antz was rushed to reach theatres in September. The international release occurred simultaneously with that of the United States, as according to DreamWorks' distribution chief Jim Tharp, opening one week prior to the "global holiday" of Christmas, audiences all over the world would be available at the same time. The accompanying marketing campaign was aimed to appeal to adults, usually averse to animated films. Merchandising was limited to a line of collectable figures and books. Wal-Mart served as a promotional partner and offered in stores a package featuring two tickets to The Prince of Egypt, a storybook and the film's soundtrack. The Prince of Egypt was released on DVD and VHS on September 14, 1999. The ownership of the film was assumed by DreamWorks Animation when that company split from DreamWorks Pictures in 2004; as of July 2018, the rights to the film are now owned by Universal Pictures via its acquisition of DWA. As with the rest of the DreamWorks Animation catalog, it is available for streaming on Netflix in HD. However, both the DVD release and the streaming versions used a 35mm print of the film, rather than using the original files to encode the movie directly to digital. A Blu-ray of the movie was released on October 16, 2018. The film is also available on Hulu as of January 2019. On its opening weekend, the film grossed $14.5 million for a $4,658 average from 3,118 theaters, earning second place at the box office, behind You've Got Mail. Due to the holiday season, the film gained 4% in its second weekend, earning $15.1 million and finishing in fourth place. It had a $4,698 average from 3,218 theaters. It would hold well in its third weekend, with only a 25% drop to $11,244,612 for a $3,511 average from 3,202 theaters and once again finishing in fourth place. The film closed on May 27, 1999 after earning $101.4 million in the United States and Canada with an additional $117.2 million overseas for a worldwide total of $218.6 million. 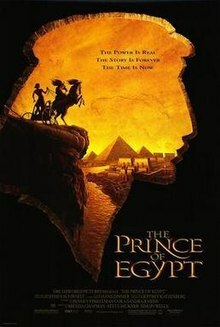 The Prince of Egypt was the second non-Disney animated feature to gross over $100 million in the U.S. after Paramount/Nickelodeon's The Rugrats Movie. It remained the top-grossing non-Disney animated film until being surpassed by the 2000 stop-motion film Chicken Run, also distributed by DreamWorks, and remained the highest-grossing traditionally animated non-Disney film until 2007, when it was out-grossed by 20th Century Fox's The Simpsons Movie. The film has a rating of 79% on Rotten Tomatoes based on 84 reviews, with a weighted average score of 7/10. The site's consensus reads, "The Prince of Egypt's stunning visuals and first-rate voice cast more than compensate for the fact that it's better crafted than it is emotionally involving." Metacritic, which assigns a normalized 0–100 rating to reviews from mainstream critics, calculated an average score of 64 from the 26 reviews it collected. Roger Ebert of the Chicago Sun-Times praised the film in his review saying, "The Prince of Egypt is one of the best-looking animated films ever made. It employs computer-generated animation as an aid to traditional techniques, rather than as a substitute for them, and we sense the touch of human artists in the vision behind the Egyptian monuments, the lonely desert vistas, the thrill of the chariot race, the personalities of the characters. This is a film that shows animation growing up and embracing more complex themes, instead of chaining itself in the category of children's entertainment." Richard Corliss of Time magazine gave a negative review of the film saying, "The film lacks creative exuberance, any side pockets of joy." Stephen Hunter from The Washington Post praised the film saying, "The movie's proudest accomplishment is that it revises our version of Moses toward something more immediate and believable, more humanly knowable." Lisa Alspector from the Chicago Reader praised the film and wrote, "The blend of animation techniques somehow demonstrates mastery modestly, while the special effects are nothing short of magnificent." Houston Chronicle's Jeff Millar reviewed by saying, "The handsomely animated Prince of Egypt is an amalgam of Hollywood biblical epic, Broadway supermusical and nice Sunday school lesson." James Berardinelli from Reelviews highly praised the film saying, "The animation in The Prince of Egypt is truly top-notch, and is easily a match for anything Disney has turned out in the last decade", and also wrote "this impressive achievement uncovers yet another chink in Disney's once-impregnable animation armor." Liam Lacey of The Globe and Mail gave a somewhat negative review and wrote, "Prince of Egypt is spectacular but takes itself too seriously." MovieGuide also reviewed the film favorably, saying that "The Prince of Egypt takes animated movies to a new level of entertainment. Magnificent art, music, story, and realization combine to make The Prince of Egypt one of the most entertaining masterpieces of all time." The Prince of Egypt was banned in three countries where the population is predominantly Muslim: the Maldives, Malaysia, and Egypt on the grounds that the depiction in the media of Islamic prophets (which includes Moses) is forbidden in Islam. The movie was also banned in Indonesia, but was later released in Video CD Format. The Supreme Council of Islamic Affairs in the Maldives stated: "All prophets and messengers of God are revered in Islam, and therefore cannot be portrayed". Following this ruling, the censor board banned the film in January 1999. In the same month, the Film Censorship Board of Malaysia banned the film "so as not to offend the country's majority Muslim population." The board's secretary said that the censor body ruled the film was "insensitive for religious and moral reasons". In November 2000, DreamWorks Animation released Joseph: King of Dreams, a direct-to-video prequel based on the story of Joseph from the Book of Genesis. The project began during production of The Prince of Egypt, employing some of the same animation crew and featuring director Steve Hickner as an executive producer. The Prince of Egypt debuted at TheatreWorks in Mountain View, California on October 14, 2017. The show had an international premiere on April 6, 2018 in Denmark at the Fredericia Teater. ^ "The Prince of Egypt (1998)". The Numbers. Retrieved February 18, 2019. ^ Lovell, Glenn (December 10, 1998). "Review: 'The Prince of Egypt'". Variety. Retrieved April 23, 2017. ^ a b "DreamWorks' `The Prince of Egypt' Attends UCLA's Royce Hall" (Press release). The Free Library. December 16, 1998. Retrieved May 29, 2014. ^ "DreamWorks debuts "Prince of Egypt" albums". Animation World Network. October 30, 1998. Retrieved May 29, 2014. ^ "The Prince of Egypt (U)". British Board of Film Classification. November 26, 1998. Retrieved August 27, 2016. ^ a b c d e f g h "Prince of Egypt (1998)". Box Office Mojo. Retrieved February 25, 2009. ^ a b c d "Dan Wooding's strategic times". Assistnews.net. Archived from the original on March 29, 2003. Retrieved March 3, 2009. ^ a b c d e f g h "Prince of Egypt-About the Production". Filmscouts.com. Retrieved March 4, 2009. ^ Horn, John (June 1, 1997). "Can Anyone Dethrone Disney?". Los Angeles Times. Retrieved December 25, 2014. ^ "DreamWorks Animation In Process Of Being Sold To Japan's SoftBank". Inquisitr.com. Retrieved December 25, 2014. ^ Felperin, Leslie (1998). "The Prince of Egypt". Retrieved December 25, 2014. ^ a b Tracy, Joe (1998). "Breathing Life Into The Prince of Egypt". AnimationArtist.com. Archived from the original on August 13, 2003. Retrieved December 25, 2014. ^ "Respect for Tradition Combined With Technological Excellence Drives Cambridge Animation's Leadership". Animation World Magazine SIGGRAPH 98 Special. Retrieved December 23, 2014. ^ Schaffer, Christen Harty (Writer-Producer) (1998). The Making of The Prince Of Egypt (Short-form video). United States: Triage Inc., DreamWorks, LLC. ^ a b "Sound design of Prince of Egypt". Filmsound.org. Retrieved March 13, 2009. ^ a b "SoundtrackNet:The Prince of Egypt Soundtrack". SoundtrackNet.net. Retrieved March 4, 2009. ^ Natale, Richard (February 26, 1999). "Production on Animated Films Gets Drawn Out". Los Angeles Times. Retrieved May 20, 2015. ^ Eller, Claudia; Bates, James Richard (December 22, 1998). "Waters Don't Part for DreamWorks' 'Prince of Egypt'". Los Angeles Times. Retrieved May 20, 2015. ^ Wallace, Amy (April 6, 1998). "A Big Gamble in the Making". Los Angeles Times. Retrieved May 20, 2015. ^ Wallace, Amy (October 27, 1998). "Marketing Without Toys, Action Figures". Los Angeles Times. Retrieved May 20, 2015. ^ Kilmer, David (September 13, 1999). "DreamWorks sponsors chariot race on Hollywood Boulevard". Animation World Network. Retrieved November 4, 2014. ^ Symington, Steve (August 24, 2013). "DreamWorks Should Turn Back to the Bible for Its Next Big Hit". Fool.com. Retrieved December 26, 2014. ^ "The Prince of Egypt Blu-ray". Blu-ray.com. August 26, 2018. Retrieved August 27, 2018. ^ "Highest grossing animated films". Box Office Mojo. Retrieved February 28, 2009. ^ "The Prince of Egypt movie reviews". Rotten Tomatoes. Retrieved February 27, 2009. ^ "The Prince of Egypt (1998): Reviews". Metacritic. CNET Networks. Retrieved February 27, 2009. ^ "The Prince of Egypt: Roger Ebert". Chicago Suntimes. Retrieved February 27, 2009. ^ Corliss, Richard (December 14, 1998). "Can a Prince be a movie king? - TIME". Time Magazine. Retrieved March 12, 2009. ^ "The Prince of Egypt: Review". The Washington Post. September 7, 1999. Retrieved February 27, 2009. ^ "The Prince of Egypt: Review". Chicago Reader. Retrieved February 27, 2009. ^ Millar, Jeff (December 18, 1998). "Prince of Egypt". Houston Chronicle. Retrieved April 4, 2012. ^ "Review:The Prince of Egypt". Reelviews.net. Retrieved February 27, 2009. ^ "The Globe and Mail Review:The Prince of Egypt". The Globe and Mail. Archived from the original on August 18, 2004. Retrieved March 12, 2009. ^ "CNN Showbuzz — January 27, 1999". CNN. January 27, 1999. Retrieved March 12, 2009. ^ "Malaysia bans Spielberg's Prince". BBC News. January 27, 1999. Retrieved July 17, 2007. ^ "The 71st Academy Awards". Oscars. March 21, 1999. Retrieved February 27, 2009. ^ "27th Annual Annie Award Nominees and Winners (1999)". Annie Awards. Retrieved September 30, 2015. ^ Clinton, Paul (January 25, 1999). "'Saving Private Ryan' wins critics' top award". CNN. Retrieved May 20, 2015. ^ "The 56th Annual Golden Globe Awards (1999)". Hollywood Foreign Press Association. Archived from the original on September 29, 2006. Retrieved February 27, 2009. ^ Kim, Ellen. "NEWSMAKERS: Hollywood Invades the Grammys". Hollywood.com. Retrieved May 20, 2015. ^ "1999 Awards". International Press Academy. Archived from the original on July 12, 2000. Retrieved June 24, 2014. ^ "Archive - Joseph: King of Dreams". Crosswalk.com. November 3, 2000. Retrieved June 1, 2014. ^ Ramirez, Robert (November 7, 2000). "Out of Character: The Making of Joseph". Animation World Network. Retrieved May 30, 2014. Cerny, Jaroslav. "The Will of Naunakhte and the Related Documents." The Journal of Egyptian Archaeology 31 (1945): 29-53.